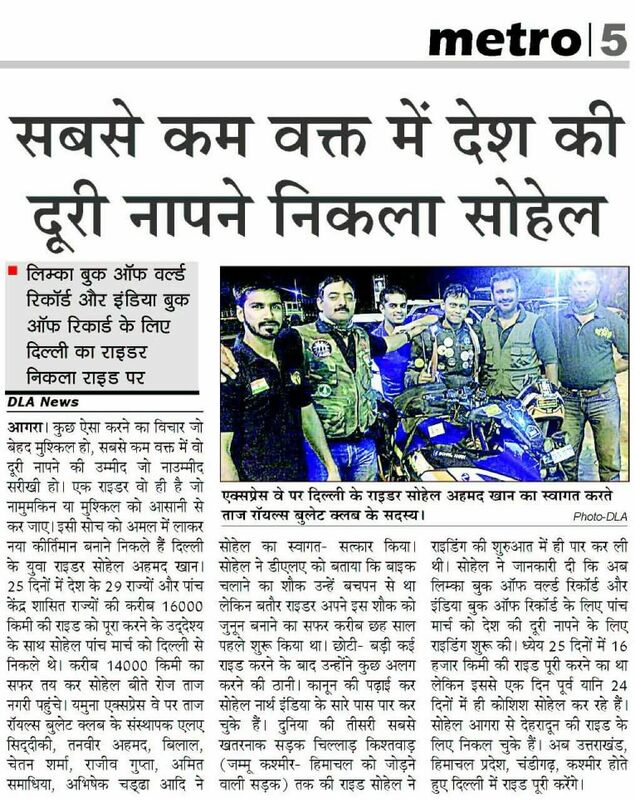 I was inspired by my elder brother Javed, who is a software engineer by profession when he visited Ladakh on his bike, back in 2010. 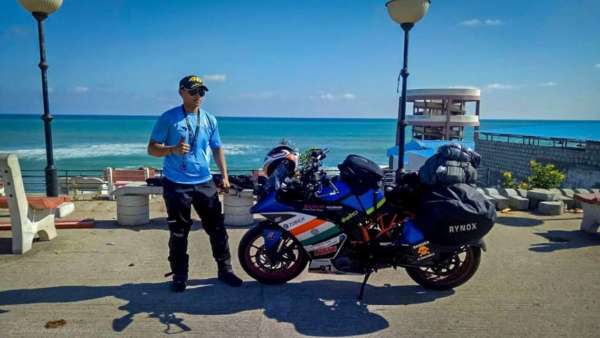 Since then I have completed many extreme rides to places like Ladakh and Spiti, along with some of the most dangerous high altitude passes including the Sach pass, Chanshal and Jalori. I have also completed a solo ride through one of India’s deadliest roads from Killar to Kishtwar in Himachal Pradesh. I started planning my cross-country ride covering all 29 states in the minimum possible time back in 2016. 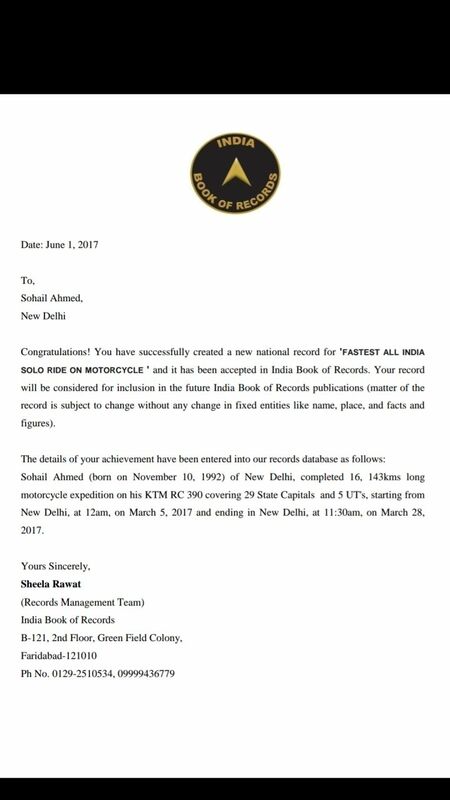 After approaching the Limca Book of Records and India books and getting their approvals for the run, I started my final preparations for this ride in January 2017. I covered all the expenses of the ride myself. 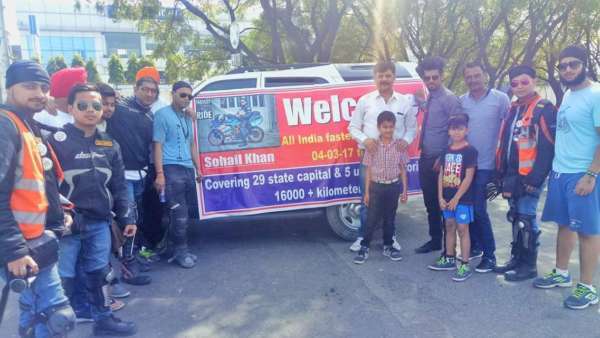 I started my ride on my KTM RC390 on March 5, 2017 at 12 AM from Delhi and completed the journey at 11:27 AM on March 28, 2017, covering all 29 States with their Capitals and all 5 Union Territories – a total distance of 16,143kms in just 23 days. Initially, I was not very enthusiastic about the idea since I had never gone on such a long trip all by myself.But having seen many riders across the country having undertaken such solo rides, I knew it was definitely possible. I decided to keep a positive mind-set and give it my best shot – fortune favours the brave after all, as they say. Even though many of my friends and relatives advised me to cancel my ride, especially given the political instability in multiple regions across the country, including the seven sisters, it was the constant moral and financial support that I received from my parents that made the ride possible. Attestation of the Log Book – I was provided with a detailed log book by the Limca Book of Records that I had to maintain by getting it attested by gazetted officers or police stations at each of capital and union territory that I visited. In most states, this process was seamless as the police cooperated with me. However, in Ranchi and Patna, I was made to run from pillar to post to get the proper signatures which cost me a lot of time and also caused a lot of frustration. Poor Service at KTM Ranchi – I had informed the service centre well in advance as my RC was expected to become due for its periodic check-up when I reached that city. Despite waiting for over 2 hours at the service centre, they did not attend to my bike at all. Subsequently, I had to get my bike serviced from a non-authorized centre outside which caused me a delay in reaching Kolkata, my destination for the day. I reached Kolkata at 2:30 AM in the morning – 5 hours post my planned time and this delay got carried over to the next day as well. Cashless India, Cashless me – I happened to run out of cash while I was in Itanagar and was left with no money to pay my hotel and fuel bills. I tried withdrawing cash from over a dozen ATMs in the city but none of them had any cash reserves. I finally had to bank on a few friends in the city who helped me out. Assam Rifles (Indian Army) – After getting my bike checked at KTM Silchar, I set off from the city at 12 PM with the plan of reaching Imphal by 7 in the evening. Unfortunately, it started raining heavily and the unpaved roads started turning tricky. There was one particular stretch of about 8 Kms which proved to be extremely problematic. The fact that I was riding alone made it even more challenging as I repeatedly ended up getting stuck in the slush. The bike started overheating and eventually gave way as the coolant started leaking out. None of the drivers passing by were willing to help and I was not even being able to get mobile connectivity to be able to reach out for help. I was starting to feel miserable as this could have proved disastrous for my record run. Locals advised me to head for the Army Chowki which was about 15 Kms from that place. I prayed to almighty and hit the starter of my bike and luckily, it obliged. I headed straight for the Assam Rifles Camp. The Jawans took me in, and offered me food and shelter. As Imphal was still over 180 Kms away and the route passed through dangerous militant-infested regions, they advised me to stay the night at the camp. I will truly thankful to the officers for their incredible hospitality and affectionate treatment. Police Staff at all the State Capitals and UTs: All the police staff was extremely supportive and humble which helped me receive my necessary attestations on time. I am especially thankful to the ACP of Trivandrum, Pramod Sir for his great support. KTM Service Centres: The authorized service stations at Panvel, Puducherry, Agartala, Silchar, North Lakhimpur, Patna and Noida helped me in getting my bike ready on time through my journey. 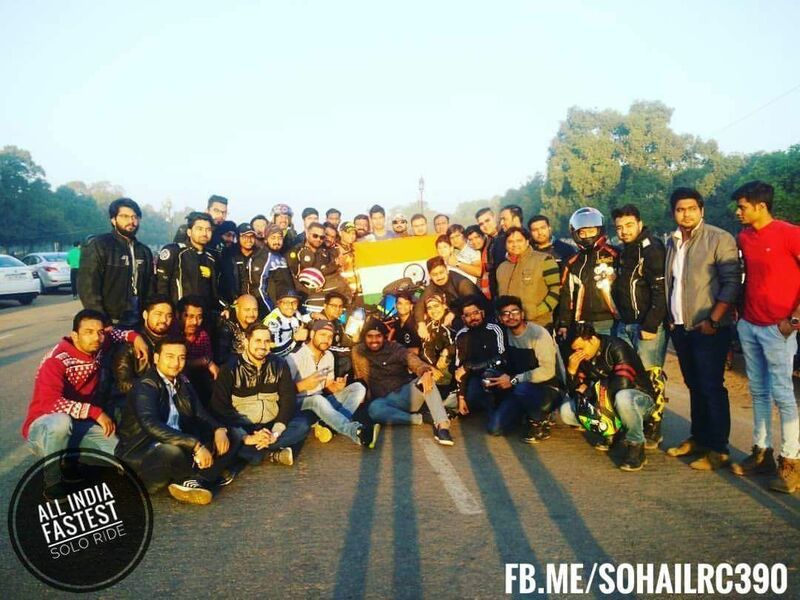 Riding Fraternity: All My Rider brothers from every state and city who supported me in my entire ride without which, it would not have been possible to complete the record run. My Backup Team: My team was active throughout the day and constantly remained updated with all the developments f my ride. My fellow club members at Rapsters were extremely supportive as well. My Bike: Even though the ride was termed as the “Fastest Ride” but in practice, it required me to cover a set distance on a daily basis. The ride for record title was entirely dependent on the performance of my bike which fortunately, remained perfect throughout my journey. Rigorous physical workout for 2 hours daily for over a month to help me increase my stamina. I started reducing my diet a month before the start of my ride to adapt myself to fewer meals during my journey. Through my entire 23 day trip, I used to have just one proper meal at night. During the day, I used to rely on dry-fruits, chocolates and lots of water to keep myself hydrated and energized. To be able to break the record, I had to cover a given distance within a stipulated time period. This meant that I could only sleep for about 4-5 hours every day. After getting stuck in the North-East, my whole schedule started lagging by 2 days. 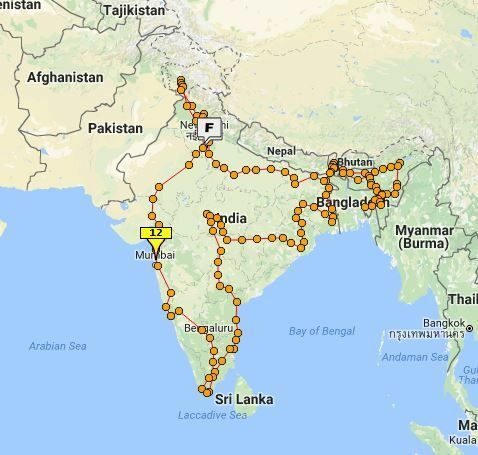 To be able to break the record, I had 6 states, 1 union territory and well over 3000 Kms to cover in just 3 days. Riding against the odds, I started from Patna, passed Lucknow, Dehradun, Shimla, Chandigarh, Srinagar before hitting Delhi – a continuous run of about 78 hours with just three 2-hour long power naps in the middle at Noida, Chandigarh and Patnitop. Finally, by the grace of almighty and cooperation from my friends and family, I was able to complete my trip, spanning a total of 16,143 Km in 23 Days, 11 Hours and 27 Minutes.